Free State High Court Judge Connie Mocumie doesn’t pull punches. During her unsuccessful 2014 interview to head her division, she noted that there are “divergent views on transformation of the judiciary” and while the “Judicial Service Commission has tried to deal with it head on … we are not speaking the same language”. Turning to the female members of the then newly constituted commission, she urged them to fight “this man thing” of “guys clubbing together” and to take up the cudgels for gender transformation within the JSC. Mocumie has exercised studious judicial reasoning and sensitivity when hearing cases – even when acknowledging “several material misdirections” of lower courts, as in the case of a police officer who had appealed a murder conviction and 12 year sentence in the SCA, where she has previously acted. The cop had shot two people, killing one, during an altercation in a bar. Mocumie considered forensic evidence and expert evidence, concluding that the lower court had erred in its guilty finding. But, she noted the “long serving police officer” had “considerable experience in handling firearms [and] ought to have realised that he was using excessive force beyond the legitimate bounds of private defence”. The cop was found guilty of culpable homicide and sentenced to five years imprisonment, conditionally suspend for five years. In 2013 the Free State department of health sought a special plea preventing a paediatric registrar from lodging claims against it after she was attacked and raped on hospital premises by a perpetrator, who was neither a patient or employee. In dismissing the health department’s plea Mocumie found that Section 35 of the Compensation for Occupational Injuries and Diseases Act did not apply to the case and that the plaintiff was not precluded from claiming damages from the health department. The decision was later confirmed by the Supreme Court of Appeal. Mocumie holds a BJuris from the University of Zululand, an LLB from University of the North West and a Masters in Family Law from UNISA. Mocumie was nominated for appointment by the Judicial Service Commission after deliberations that ran into the early hours of Tuesday morning. 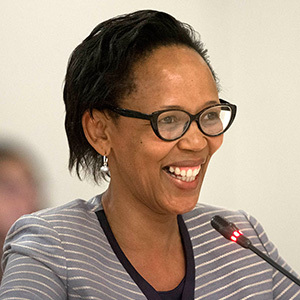 She was asked the usual openers by Supreme Court of Appeal (SCA) President Lex Mpati about how she found the collegiality at the court, and its processes around hearing oral argument and writing judgments. Mpati then observed that when Mocumie had finished her last acting stint at the SCA in 2014 she had told him that she was “not ready for the SCA and that [she] needed more experience”. Mocumie said that once she had returned to the High Court in the Free State she could “appreciate better what was required in the appeal court” and that she had also used the lessons learnt at the SCA and the Competitions Appeal Court to good use in her regular nine-to-five in Bloemfontein. She added that she may have been unduly self-deprecating in that conversation and that her subsequent experience in the high court would suggest she was in fact ready. Commissioners quizzed Mocumie on a range of issues, including her thoughts on what the obstacles to justice were (Inaccessibility of courts because of geography and poverty. ), her language proficiency (She speaks six of the country’s 11 official languages.) and whether hearings should be televised (Yes, to ensure media freedom, but with the recognition that it changes the manner of both judicial officers and witnesses.). Mocumie was as straight-talking during her as she has been in previous appearances before the JSC. The Free State High Court judge doesn’t pull punches. During her unsuccessful 2014 interview to head her division, she noted that there are “divergent views on transformation of the judiciary” and while the “Judicial Service Commission has tried to deal with it head on … we are not speaking the same language”.